Whether you are a beginner or a seasoned pro, there are plenty of opportunities to put on those running shoes and test your skills in a good ole-fashioned road race. Many races, however, have become so much more than just a start to finish event; they have become fun events for participants and watchers, alike. Atlanta is certainly in the forefront of fun and unique races for runners of all levels. Here are a few races this summer that we highly recommend checking out. The AJC Peachtree Road Race has become an Atlanta tradition. The July 4th event has been around since 1970 and attracts runners and walkers from all around the globe. 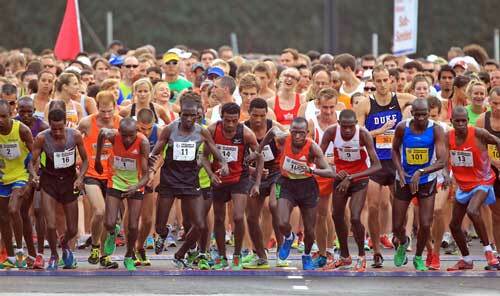 In fact, the 10K race is the largest of its kind in the world! 60,000 runners and walkers participated in the race last year. Runners range from pure amateurs to professionals and the event even served as the USA Men’s 10K Championship in 2010. Due to such high demand, there is actually a lottery system in place to select the participants. In addition to the popularity of the actual race, every year the Atlanta Journal-Constitution newspaper holds an art contest in which the winner’s design is made into a highly-coveted, limited edition t-shirt. Even if you are unable to participate in the race, it certainly is a wonderful July 4th activity. Love running and baseball? The Braves Country 4-Miler takes place on June 15th at Turner Field: home of the Atlanta Braves. Taking place on the weekend of Father’s Day, the run begins at Turner Field and ends at the Braves’ dugout after a run around the city. In addition to being able to participate in the run, registration includes a t-shirt and a ticket to that day’s 4:00 p.m. game against the San Francisco Giants. Participants also have the opportunity to participate in a pre-game parade at Turner Field. The unique event is limited to 2,000 participants. On August 3rd, the Atlanta Police Department will be hosting their annual Atlanta’s Finest 5K race. The event begins at Pemberton Place at the World of Coca-Cola and is organized by the Atlanta Track Club. In addition to the 5K race, there is a Gumshoe Gallop 1K for children in the 7-12 range and a 100-meter Gumshoe Dash for kids six and under. Besides numerous corporate and civil leaders, over 300 area police offers participated in last year’s race. All proceeds for the event go to benefit Crime Stoppers Atlanta. What’s a race list without mentioning a trendy color race? All the rave for amateur runners, the Run or Dye 5K race will be taking place on August 3rd. The event will kickoff at Turner Field and runners will run around the city where they will be color-blasted at several dye stations strategically located throughout the race route. While the color dye is safe and will wash out of your clothes, we don’t recommend wearing your Sunday best. With all the colors coming your way, a bright white t-shirt is a good way to go. For the more adventurous runners, it might be possible to run the aforementioned Atlanta’s Finest 5K run, which begins at 7:30 a.m., and the Run or Dye 5K at 9:00 a.m. If you run both, we’d certainly be impressed! Happy Can is a leading Atlanta porta potty provider and also offers Atlanta mobile sinks.